The consensus coming from expert reviews and customers alike is that the Puma 365.18 Ignite High ST football boot brings a comfortable experience for wearers. A football boot critic shared that this model allows for a secure foot lockdown through its central lacing system. Another expert review stated that the outsole of this football boot provides maximum traction in turf and indoor courts. The pair also works well for concrete surfaces. A shoe commenter also discussed that the high street version of the Puma 365.18 Ignite yields a decent amount of flexibility in the soleplate. One reviewer shared that this soccer cleat provides a decent amount of durability because of the rubber type used in its outsole. An expert review disclosed that the football boot brings a bulky feel for the ball. One user shared that the Puma 365.18 Ignite High Street runs a size small. A shoe enthusiast revealed that the shoe is heavier than the usual indoor shoe. 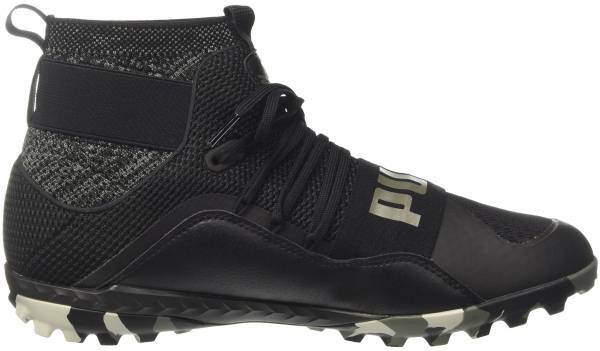 Another football boot critic expressed his distaste towards the shoe’s overall look; describing this Puma cleat as looking like winter boots. Puma took a high top football boot to the streets like never before in the form of the urban-inspired 365.18 Ignite Hight ST. Comfort-wise, this football boot has got it covered through its mesh-based upper as agreed by most users. Foot lockdown for players is not an issue either as the unique lacing allows for effective fit customizability. However, a trade-off for this shoe’s comfort is its bulky feel for the ball. Overall, if you’re one looking to stand out while playing on the street without sacrificing comfort, this pair just might do the trick. To summarize what this shoe is all about and whether or not I would recommend it. I don't think that they're bad so in that regard, I can recommend them if you like the way that they look. If you like a more heavy, padded feel on the ball and you like something that just has a more structured construction to it overall. The 365.18 Ignite High ST exudes urban vibe that is a new take on Puma street cleats. Created for fashion-forward people, this football boot is creatively designed in a high top style. By utilizing a breathable air-mesh upper that extends to the ankle area, the shoe creates a sock-like sensation that amplifies comfort on the lower legs. Across the upper is an elastic band bearing the Puma brand which seemingly is of aesthetic purposes only but serves to provide more structure to the shoe. Beside the band is a central lacing system attached to thin cable loops that allow for fit personalization. The cushioning system used for this football boot model is the brand’s Ignite technology. This allows players to personalize the fit. The polyurethane-based cushioning system allows for grip during speedy changes in direction. The outsole for this model is a rubber-based material which features multiple triangular studs. The low-profile soleplate and stud configuration are created to adapt and keep up with varying street surfaces. The Puma 365.18 Ignite High ST brings a bulky but otherwise comfortable feel for players on the pitch. In addition to this, breathability is also brought about by this model’s air mesh upper which extends to the ankle area. A central lacing system is incorporated into the shoe’s design to further the shoe’s fit. This football boot is available in men’s standard sizes. An air-mesh upper is used in the construction of the Puma 365.18 Ignite High ST football boot. This material brings breathability and comfort needed for rough street and dirt pitch rides. Another comfort element in this cleat is the knitted sock-like feature that extends to the ankle area. This high cut style is a first for the brand. It serves to hug and support the lower leg area during the fast-paced game. Pull tabs are integrated into the high cut area to facilitate easy entry to the shoe. While incorporating a tongueless design, the upper area has been extended as a collar and with it a band that reinforces the sock-like fit of the shoe. A central lacing system, which is somewhat similar to the Puma Future 18.1 Netfit FG/AG as well as the Puma One 18.1 K-Leather Firm Ground, is integrated into the upper to maximize the football boot’s fit. Dual lace holes are incorporated into the topmost part of the lacing system while rest of the laces are looped through cables. A band placed horizontally across the upper bears the Puma name in bold capital letters. The brand’s logo is also printed on the side of the shoe in a vibrant red color. Ignite Foam technology is utilized as a cushioning system for the Puma 365.18 Ignite High ST. Made from a polyurethane-based material, this midsole system is engineered to effectively bring comfort and grip for the player. Energy return is maximized for each player’s movements without causing too much strain to the lower leg. The outsole of the Puma 365.18 Ignite High ST football boot is created with a non-marking, rubber-based outsole featuring numerous studs styled in a camo pattern. This configuration allows for maximum grip and traction on street surfaces. Varied surfaces that include dirt pitches, concrete surfaces, artificial turf and polished surfaces including gymnasium floors are ideal for this football boot model. The Puma 365.18 Ignite High ST football boot is available in the black, red, and grey colorway. This street football boot has a low top version. This Puma 365.18 Ignite High ST also serves as a football training shoe.